Posted On Tue, 13 Nov 2007 05:20:00 +0000. Filed in personal finance. By Vaibhav Bhandari. I had blogged earlier about the personal finance tools available on internet. 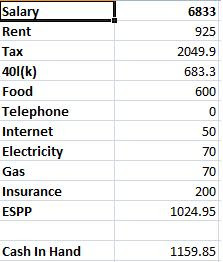 But after a long bout of finance management failure, I’m going to try and experiment by publicly doing my finances (of course some numbers are fuzzed but are close). I want to be able to get my net worth to a million dollars in seven years, is it possible? With about $2000 of Cash flow every month what sort of rate of interest should i aim for ? So for this saving to become 1million i need a rate of return equivalent to 45%, as this calculation shows!! So short question, can I achieve a consistent rate of of 45%? Is very unlikely! Which implies that i should increase by savings! This takes me to saving almost about 65K a year!!! Lets see!! Next in this line of thought I want to see what my current rate of return is. I know its less than 1o%!! So point number one is something needs to be done about this poor investment strategy! So how should one divide the quadrants of quality of life so one can balance budgeting for better life versus being frugal to have more money to invest wisely!